Your battle against the Subspace Emissary will be one of epic fury. Naturally you’re going to want to do everything you can to strengthen each character for the fight ahead. And that’s where stickers come into the picture! Did you think those stickers were just for collecting? Well, it seems you thought wrong! The truth is startling, huh? 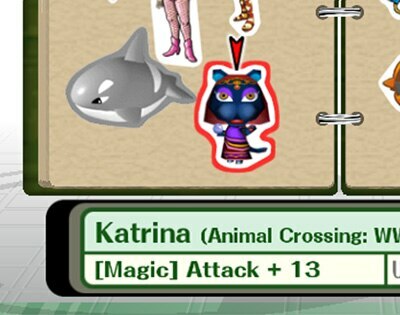 Each sticker houses a special power up. 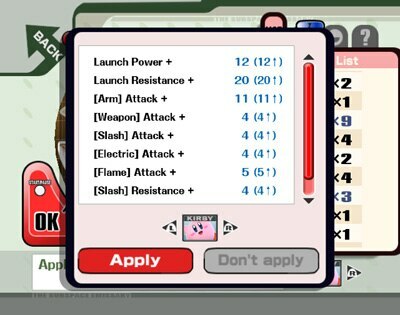 For example, some up your attack power, others bolster the damage from fire-based attacks, and some even keep you from flying as far when you take a hit. You can find the details of each sticker’s power-up ability here. 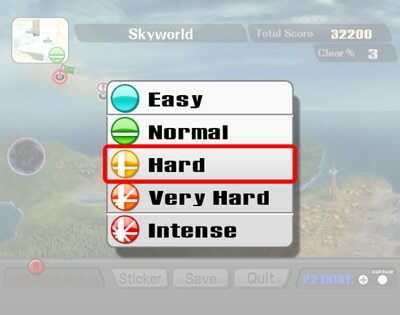 On the Map screen, select the Sticker option to move to the sticker-application screen. You can switch between characters with the L and R Buttons. Here’s a shot of the underside of a trophy base. 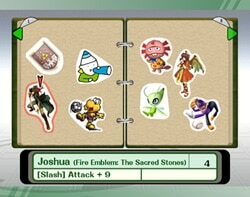 Now slap down one of the sticky stickers you’ve collected. 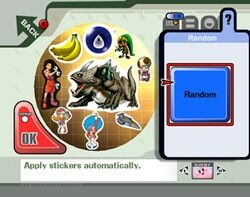 Generally speaking, the bigger the sticker, the more dramatic the power up. The more stickers you put on a trophy base, the more powerful that character becomes, but you’ll need to consider your placement and sticker choices carefully as space is limited. 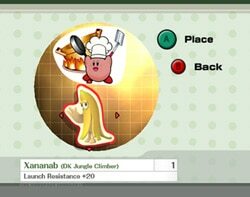 When two stickers offering a similar power up are placed on a trophy base, only the more potent of the two power ups will take effect. 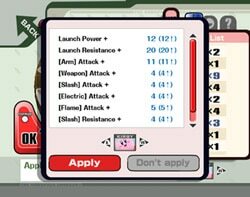 So, for example, if you had [Leg] Attack +4 and [Leg] Attack +6 stickers on the same trophy base, the added [Leg] Attack bonus wouldn’t be +10—it’d simply be treated as if you’d only put down the +6 sticker. You should always remember to maintain balance in your sticker selections. Also, some stickers can only be placed on certain characters. Stickers whose range of usage is limited in this fashion are proportionally stronger when placed appropriately. Do your best to find a good place for each sticker. If you find placing down stickers yourself too much of a bother, just let the game do it for you by selecting Random. Once you’re ready, apply all the stickers at once! You can adjust the position of stickers until you choose to apply them, but you can’t place stickers on top of each other, so you’ll occasionally need to remove old stickers to make space for new ones. Once you peel off a sticker you applied, you lose it for good! So take care when you lay down your stickers. Stickers applied to a trophy base take on a gray tint. 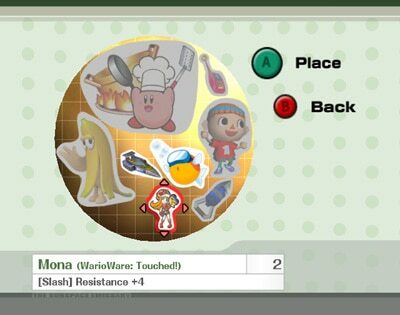 Also, for some reason, you’re able to readjust the position of an applied sticker on its trophy base. So while removed stickers are gone forever, you’ll be getting stickers left and right as you play—you’ll probably find that sticker you lost again. 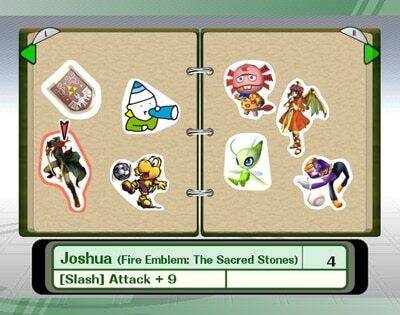 And, if you only use stickers you have doubles of, you’ll never lose one from your collection. Plus, as I’ve said before, the higher you set the difficulty in The Subspace Emissary, the better your chance of running across rare stickers. 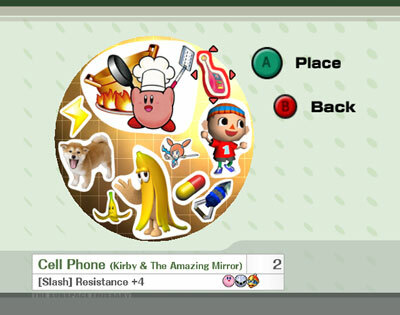 Going back to a previously completed stage and cranking the difficulty up for a second run is a good way to round out your sticker collection. 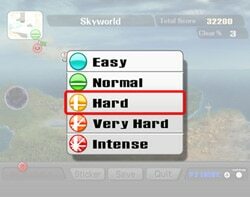 If you retry a beaten stage, you can adjust the difficulty level. 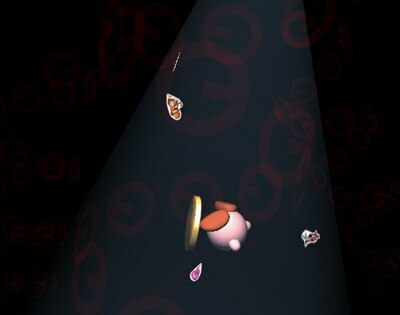 But if you should die and find yourself at the game-over screen, be prepared to lose half the stickers you collected. Nooo! What a waste of good stickers! 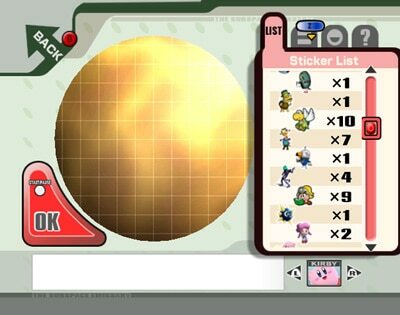 Finally, remember that stickers are only of use within The Subspace Emissary. Sorry to say, but they’ll be of no use to you in standard brawls.